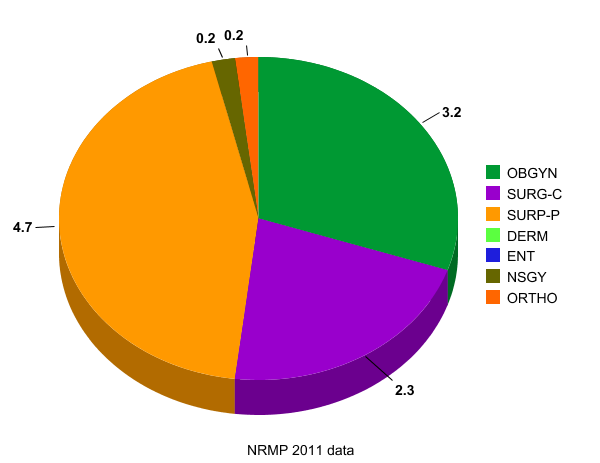 Analysis and representation of IMG friendly specialties and update of the 2010 data. Those who are practicing surgeons and want to start residency in US, the best specialties to apply are still General surgery and Obstetrics and Gynecology (figure 1, above). 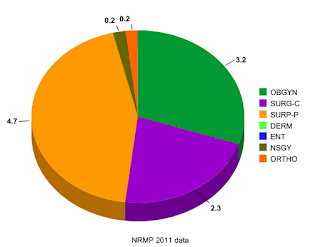 Categorical and prelim surgery together made for 7% of all IMGs matching into a surgery residency. The number of foreign trained (IMG) applicants that matched in Ob-gyn was 3.2%. Preliminary positions had the most match success for applicants than categorical surgery positions. Over the course of the last several years one thing has remained true, there are indeed IMG friendly specialties. Analysis of the IMG match data shows that Internal Medicine still retains its number one position as most IMG friendly (figure 2, above). This is evidenced by the fact that close to 37.5% of foreign trained (IMG) applicants matched to categorical medicine program. This has gone down from 39% last year. This was closely followed by family medicine coming in second at 18.8%. Pediatrics and Psychiatry made a sizable chunk of IMG applicants being successful with 8.8 (down from 8.6 last year) and 6% (up from 5.7 last year) respectively. Applicants who did not wish to pursue the above mentioned medical or surgical branches had the toughest luck. The chances of a successful match are abysmally low when it comes to rarer specialties like Genetics, Med-psych, Med-derm, urology, ophthalmology, ENT and the like. Unless you have won a Nobel prize in these branches of medicine the match rate for an IMG in these fields is close to zero and this is evidenced by '0' in the NRMP match statistic for a lot of these specialties. 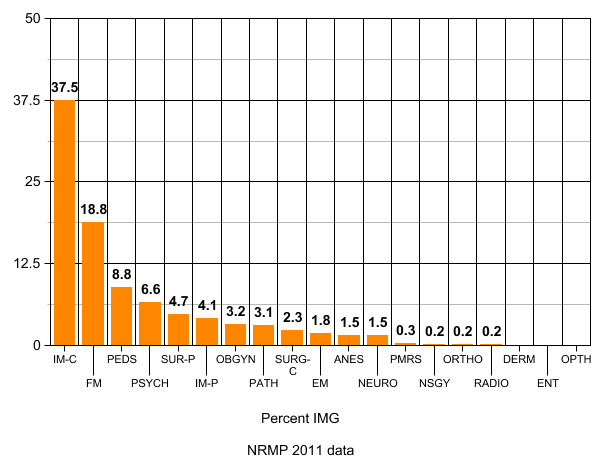 Best Chances are still IM (categorical), FM, Peds and Psych (Figure 3, above). In Conclusion, the BIG-4 are still the favorites for IMGs to successfully match. 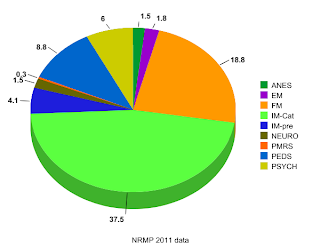 The second category of subjects belonged to the group with IMG percentage between 3.1% to 1.5%. This class included subjects like pathology, neurology, anesthesia and emergency medicine. Categorical medicine has continued to maintain a stable course of being IMG friendly while Psychiatry has slight improvement in the IMG friendliness scale. On the other hand, Family medicine though still number two on the IMG friendly list is slowly becoming 'less' friendly as the years go by. This may be a reflection of growing interest in American medical grads (AMGs) in family practice and changing practice patterns. While important issues like How Step 1 score affects interview invitations and Does timing of interview affect ranking of applicant do affect the match chances, applying to the right specialty is the extremely important. For continued updates please join me on Facebook or follow on twitter! Physician Assistant program: A better alternative to MHA or MPH? Follow the site on Facebook! This website and its content is copyright of Rohit D - © name, mleresidencytips and droidor. 2011-13. All rights reserved. It is prohibited to redistribute or reproduce the content on the site unless written explicit permission from me. You may use it for personal non commercial use. Do not distribute without proper acknowledgement of the website as reference. Discussion here or articles are not to be taken as advice. These are opinions only and author (s) are not responsible for any outcomes that arise as consequence of using the content on the site. The information is provided 'as is'.